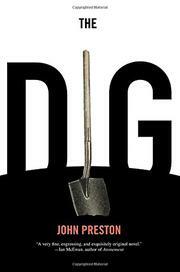 A historical novel that looks at the foibles and emotions of people involved in an archaeological dig on the grounds of a Suffolk, England, estate in 1939. When Edith Pretty wants to know what lies beneath the earthen mounds on her property, she hires Basil Brown, a soil expert recommended by the local Ipswich Museum. Brown soon realizes he's working on one of the most important finds in England. But word gets out, and all too soon an oversized figure is descending the ladder into Brown’s dig. It's Cambridge archaeologist Charles Phillips, bow-tied and bumptious, who bullies his way into control of the site. Cut to a coastal hotel where Stuart and Peggy Piggott are but a few days into their tepid honeymoon (“After breakfast Stuart went for his morning walk”) when a telegram from Phillips summons them to the dig. The two archaeologists hasten to Brown’s mound and soon come upon gold ornaments and other evidence of a kingly interment that may well “alter our entire understanding of the Dark Ages,” Peggy opines. Signs of the approaching war slowly accumulate: trenches dug in Hyde Park; barrage balloons above Suffolk. Using the voices of Edith, Basil, and Peggy, Preston (Kings of the Roundhouse, 2005, etc.) gives different views of the project while working in diversions and digressions: a cave-in that almost kills Basil; Edith’s weakness for spiritualists; the unspoken tale behind the untidy bed in an unused guestroom and a servant’s sudden departure. There’s a bittersweet aside in which one of Edith’s nephews and Peggy so quickly warm to each other that romance seems about to bloom amid the artifacts. As homey at times as chamomile tea but spiked with pointed undercurrents, this is a real treat for a reader who can appreciate its quiet pleasures.